It was on 23rd January 1923, that Arnold Lunn ushered Mrs Duncan Harvey, Doreen Elliott and his wife, Lady Mabel, into Room 4 (his wonderfully disorganised office) at the Palace Hotel, Mürren, and suggested that they should set up a Ladies’ Ski Club. In 1908 he had founded the Alpine Ski Club to encourage ski touring, which did not admit women. Some said the Ladies Ski Club was set up to stop ladies wanting to join the Alpine Ski Club. This Arnold Lunn hotly denied and insisted that he just wanted his country to have the honour of founding the first club for lady skiers. The Swiss girls from Wengen, across the valley, followed our example and set up the Schweizerischer Damen Skiklub. The two clubs enjoyed many years of friendly rivalry. It is true that Arnold was proud of the dashing, brave and often beautiful lady skiers of the time. In 1913 he had written in his book "Ski-ing" that the sport was "Admirably adapted to the physique of the average woman. If the lady runner has mastered the correct style, her ski-ing will be free and effortless. The sport does not involve ungainly attitudes. A lady playing hockey is a strangely unaesthetic object but the same woman on ski may easily prove more graceful and attractive than in any other role." I do hope that as you ski down the mountains next season you will remember to be aesthetic rather than ungainly. There is no doubt that our ladies were the best in the world and this was proved by the 18-year-old Esme Mackinnon winning the first World Alpine Ski Championships for Ladies in 1931. Her name starts the list of lady champions published by FIS. It was she who reached the end of the downhill at Lauterbrunnen to find a funeral winding slowly across her path. She politely stood aside and waited for it to pass and fortunately the timekeepers - equipped with hand timing in those days - stopped their watches until the procession passed. You may see hazards down the courses today but I don't think you will ever meet a funeral. All our presidents have been distinguished. Lady Denman, the first, founded the National Federation of Womens’ Institutes. Dame Katherine Furse, who followed her from 1926-29, was a writer, an artist, a great lover of skiing at Davos and for many years could be seen in the Tate Gallery as the model for her husband’s famous painting, Diana of the Uplands. With a friend, she ran a “rest station” in France in the first World War, which became a laundry depot, a dispensary, a left luggage office and a haven for our troops. She organised the VAD, created the WRNS, and was director of the World Bureau of Girl Guides. No wonder our club was well set up. Lady Mabel Lunn, Peter’s mother, was the first British lady to be awarded a gold badge for passing the First Class Ski Running Test. She also entered the first modern slalom, judged on speed, organised by Arnold Lunn in 1922, and came third after two men. In 1928 Doreen Elliott competed in the very first Inferno and when a racer fell she climbed back and spent 8 to 10 minutes digging her out, collecting poles and generally looking after her. Doreen still came 4th in that race but perhaps conditions were rather different from those today. 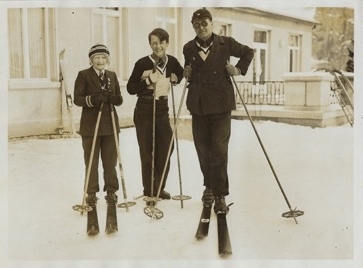 Ladies often raced with the men in those days, though the Poles were rather surprised when they organised a major international downhill at Zakopane in 1929 and the British team included Doreen Elliott and Audrey Sale Barker. The Polish organisers protested that there was no precedent for ladies to race downhill but Arnold said the British didn’t follow precedents in downhill racing and he had carefully written to confirm that this race was open to all. Not only did our two ladies race but they came 13th and 14th in an entry of 60 men and when they entered the Warsaw restaurant that evening everyone stood up and applauded. And Doreen had a great deal to do with the early success of the LSC. A founder member, she acted as Secretary for many years, was president from 1935-38 and was for some time resident rep in Mürren. I was lucky enough to meet her there myself and she took me off-piste down a slope which she assured me was known as “screaming monkeys”. I expect I screamed a bit but she waited patiently. She died in 1966 and left all her books to the Ski Club of Great Britain. When I was checking through the LSC bulletins there I found a handwritten letter from Doreen pinned inside the 1929 edition. It was addressed to Enid Fernandes – a later president – saying Enid had just been elected as an LSC member, enclosing rules, bulletin, bankers order and encouraging her to come to the annual Club lunch. The LSC always has friendly and efficient secretaries. Lady Raeburn was president from 1938-45 and mother of Digby and Patricia. During the war she stayed in London and kept the SCGB going. In the late 1920's she was a member of the LSC team which beat the Swiss ladies of the SDS. She and Arnold often watched their sons racing together, when Peter and Digby were teenagers. Addy Pryor, a great racer after the war, married Digby and was president from 1963-66. Jeannette Riddell, (president 1948-51) came third in the first World Championships slalom in 1931 and in 1934 won the ladies Arlberg Kandahar. She also captained the British ladies team at the 1936 Olympics. Arnold wrote that he was inspired by her effective and unobtrusive captaincy. She edited the LSC bulletin for many years and, when she died, Ali Riddell took over the magazine, widening its scope, and all the while Jimmy contributed wonderful sketches. Liz Fraser followed the splendid tradition and Shirley Stevens again improved it with colour. Now Jane Fawkes adds her professional expertise to keep everyone in touch with the activities of the Club. Many families have strengthened the LSC. Helen Tomkinson taught us all so much and was quite indefatigable. Once when Chief of Race she was worried about the visibility on a downhill course. So she got up very early and walked up the mountain, strewing pine needles to define the course. No wonder FIS made her one of their very few lady Honorary Members. President from 1951-4, Helen started the valuable contribution made by her family to the LSC. Lady Blane, her mother, was president from 1960-63 and her daughters also became presidents, Di Lewthwaite from 1972-75 and Ginny Evans quite recently from 1999-2002. Di’s daughters, Emma and Mary Clare, took their turns on the committee. Many of you will remember Isobel (Soss) Roe, our president from 1957-60 and British champion from 1939-49, who channeled so many people into useful jobs on the snow. It was Soss and Liz Fulton who started the Schoolgirl Races. At first they were organised for the finishing schools in Switzerland and were run in Gstaad. Then Fenella Lees with David took them over for the LSC and Anne Taylor, Christine Graves, Sarah Robinson, and Gill Head ran last season’s immensely successful event in Flaine. The late ‘60s were difficult years for racers. The National Ski Federation had taken over British ski racing from the SCGB. Money was (as now) short and there was a great deal of argument. Several clubs closed down. But Joan Raynsford (president 1968-72) was determined that the LSC should survive. She breathed new life into the club and instead of closing down it took a turn for the better. Happily Sheila Hensman followed from 1987-90 and it was good to see another generation of Hensmans at the 2003 anniversary dinner. I have left out so many good presidents and it is not only they who have worked hard for us. In 1924 the first notebook containing club accounts meticulously recorded each financial transaction, starting with a penny ha’penny stamp and over the years the tradition has lasted. Jill Coke and Jane Glasson were treasurer and secretary for many years and it is proof of how well they did that we have such good people as Anne Taylor and Penny Hedley Lewis today. It is invidious to single out a few of the very many members who have contributed in so many ways over the years but I must mention Maria Goldberger, manager of the British girls team with such good results in the 1960's. And the Club has always been able to rely on people like Penny Mabey, Pat Pettifer and Joan Sturges to help organise, write, sell and collect. Over the years our Club has raised funds to support the girls who ski race. For many years this was done by an annual sale of ski clothes and equipment. But once the SCGB left central London, this became less profitable. The club benefits from many generous donations from its members, runs raffles and since 2002 has organised a sponsored walk which raises funds at the same time as giving members an opportunity to spend a day in the country, getting fit for the following season. Penny Mabey very generously left an annual award and after the sad death of Kim McGibbon her friends raised a memorial fund in her name. Today the LSC is very strong. Every bulletin is full of news from the racers. Most of our best lady racers and race organisers are members. Ingrid Christophersen was awarded the MBE for services in 2007. The LSC committee works hard. After competent and sympathetic direction from Jenny Shute, Gill Head has added her knowledge and expertise to its development. The Schoolgirl races give British girls an excellent opportunity to enter well-organised races, as well as enjoying themselves. And new ideas keep on coming - several Walks; a Picnic at Ingie Christophersen’s home, Bentley; a Mushroom Foray organised by Ali Riddell in the New Forest and the new Inter-Club amateur races at Mürren in March have all become very successful ways to get together as well as raising funds. The aims of the club were set down as "to promote skiing and good fellowship among women ski-runners" and that is well carried out today.